The Third-Party Sender Identification Tool helps financial institutions and their ACH customers understand their roles when an intermediary is involved in some aspect of ACH payment processing by asking a series questions that can help to identify whether a business is a Third-Party Sender. "What is a Third-Party Sender?" Video brings high-level awareness regarding the importance and value that Third-Party Senders bring to the payments ecosystem and why properly identifying them helps to ensure a safe and reliable ACH network for all payment systems stakeholders while also continuing to allow for innovation in payments processing. For educational distribution, Standard and Extended versions (in SD and HD formats) of the video are available for download on our Vimeo channel. Simplified Scenarios of Third-Party Senders offers a few Third-Party Senders examples involving payroll and tuition processing, HOA dues and property management for vacation rentals. Third-Party Sender Registration provides Rule information and details for ODFIs to register their Third-Party Sender customers. Third-Party Sender ACH Operations Bulletin includes additional guidance and definition regarding Third-Party Senders and Other Payment Intermediaries. 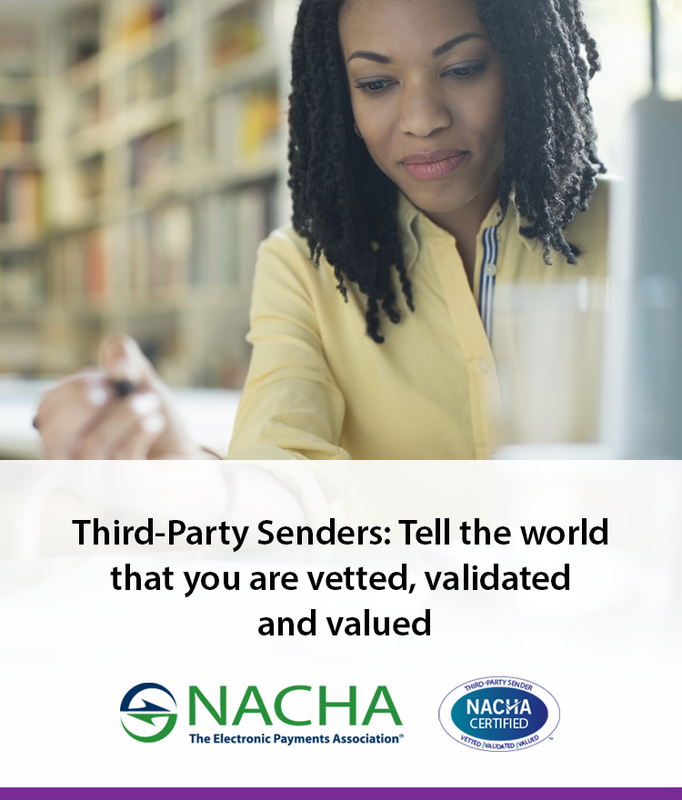 Additional Third-Party Sender resources and education can be found on the NACHA eStore or by contacting a Regional Payments Association. Financial institutions are encouraged to obtain their own legal counsel regarding their obligations under the NACHA Operating Rules and other applicable legal requirements.